Second Empire Restaurant and Tavern offers a Chef’s Table for 2 – 8 people to dine exclusively in our kitchen with Chef Daniel Schurr and his staff. Each dinner will feature a menu along with wine pairings specially designed for you and your guests. You will interact directly with the Chef and his staff throughout your dinner and thereby experience firsthand the techniques utilized by them. For Reservations, Please Call 919-829-3663. We love when our guests have amazing experiences, that is what we strive for. 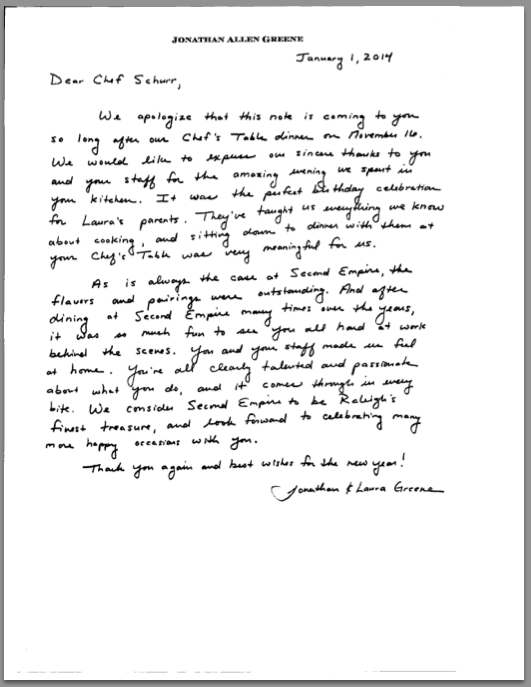 Below is a letter that captures that spirit and we hope to create a similar experience for you!